CSZ CMS is an open source web application that allows to manage all content and settings on the websites. We’re small but professional business. We’re the founder of CSZ CMS. The performance and security is our top priority. 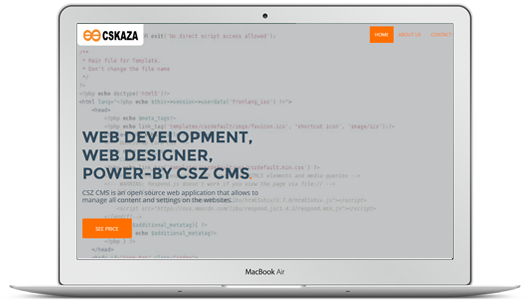 CSZ CMS is very easy to use and more security with Codeigniter structure. We are the founder of CSZ CMS. We can make the plugin for your required. We can design the template with Bootstrap. This should make your website fully responsive with ease. We are professional for CSZ CMS. 7/24 Support on support package. We have cloud hosting technology. Fast and stable. 99.9% uptime guarantee for cloud hosting to run your website. All package have free ssl. We use free Let’s Encrypt or Cloudflare SSL on Cloudflare in package. This is gallery of portfolio. You can see our customer on this section. Please click the button to see more. * Is free for first year only. for next year is below=. - Domain name (.com, .net, .org, .info, .biz) ฿450/Year. - (DirectAdmin for VPS) DirectAdmin Control Panel License + Config ฿7,490/Year. ** Add more language plus ฿500/Language/Page. Add more page plus ฿1,000/10 Pages. Add more photo plus ฿500/10 Images. Re-touch photo plus ฿1,000/Photo. All package include for upgrade the CSZ CMS to latest version all lifetime. For support after warranty expired it's have a cost (Special Offer! 50% discount support cost for all package now / First year only). Remark: For support after warranty expired it's have a cost (Special Offer! 50% discount support cost for plugin dev package now / First year only). Copyright © 2019 CSKAZA Web Development.